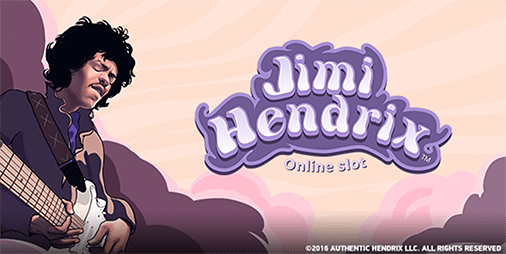 The Jimi Hendrix online slot game is one of Net Entertainment’s finest productions. The sequel to the Guns N’ Roses slot in the NetEnt Rocks series, it features the unmistakable riffs and sounds of Hendrix throughout the game – including classic hits such as ‘Foxxy Lady’ and ‘Voodoo Chile’. This isn’t just any old video slot with Jimi’s name slapped on, however, as the game is loaded with special features and bonuses aplenty. There is an auto-play feature that allows players to let the reels spin automatically until specified. Players can opt to stop the auto-spins on any win, if a single win exceeds a certain amount, if their bankroll increases or decreases by a certain amount, after a certain amount of spins, or after other set limitations. Only the highest win per payline is paid, all wins pay from left to right (except for scatter wins, which pay any way). 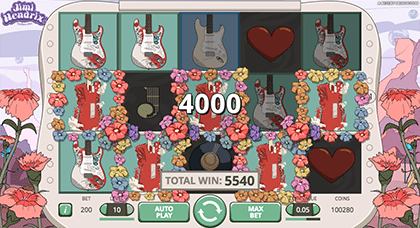 To check out the payouts for all the Jimi Hendrix symbols, access the ‘info’ button at the bottom of the game. The coin payout values listed are based on bet level one. The Jimi Hendrix online and mobile slot game boasts several unique and exciting bonus features. In fact, we would go so far as to say this title boasts a collection of bonuses unmatched by any other interactive Web-based slots we have come across. Jimi Hendrix wild: The Jimi Hendrix head shot wild icon substitutes for all other symbols (except the scatter icon) to complete any possible winning combinations. Purple Haze feature: When the Purple Haze symbol appears on reel one in the main game, all A, K, Q, J and 10 icons are transformed into wilds for that spin only. The Purple Haze symbol on reel one also acts as a wild feature after all other symbol transformations. Red Guitar Re-Spin feature: Land four or more Red Guitar icons in the main game (anywhere on the reels), the Red Guitar Re-Spin feature is activated. Once activated, the reels will re-spin once. If any more Red Guitar icons appear during the re-spin, another re-spin will occur until no more Red Guitar symbols appear any longer. The Pick and Click feature: This feature is activated when you land three or more scatter symbols anywhere across the reels in the main game. Scatter icons appear only on reels three, four and five. When activated, the Pick and Click game offers the chance to win one of four instant prizes. Click on the loudspeakers to reveal the treasures hidden behind them. If you match three of the same prize, that’s what you win. Only one prize can be awarded during a Pick and Click bonus. 1. Coin Win – Collect three coins and win a random multiplier between x8 and x30 of your initial wager in the main game. 2. Crosstown Traffic Free Spins – Collect three Crosstown Traffic Free Spins icons and win six free spins where entire reels turn wild. On the first free spin, reel five turn wild; on the second free spin, reels four and five are wild; on the third free spin, reels three and four go wild; on the fourth free spin, reels two and three turn wild; on the fifth free spin, reels one and two are wild; and on the final free spin, reel one is wild. Expect some major payouts here. 3. Purple Haze Free Spins – Collect three Purple Haze Free Spins icons and score between six and 12 free spins, during which all A, K, Q, J and 10 icons become wild symbols. 4. Little Wing Free spins – Collect three Little Wing Free Spins symbols and collect between six and 12 free spins with three, four, or five overlay wilds appearing randomly on the reels for each spin. Unlock the bonus features and the corresponding Jimi Hendrix hits will start rocking in the background (Little Wing, Purple Haze, Crosstown Traffic). These Internet casino sites are powered by the latest browser-based Flash, HTML5 and Java gaming technology, so all games are played instantly in your Web browser with no downloads required. Make secure and immediate real money deposits and withdrawals via any of the globally trusted banking methods available, including credit and debit cards, e-wallets, pre-paid cards and vouchers and direct wire transfers. These endorsed real money casino sites are all licensed and regulated by gaming governing bodies in their respective jurisdictions (e.g. the Malta Gaming Authority). They are also audited on a regular basis by independent player protection and fair game testing agencies such as eCOGRA (the eCommerce Online Gaming Regulation and Assurance body). Each site also boasts its own mobile version where the Jimi Hendrix slot can also be played on smartphone and tablet while retaining its visual quality and gameplay features. 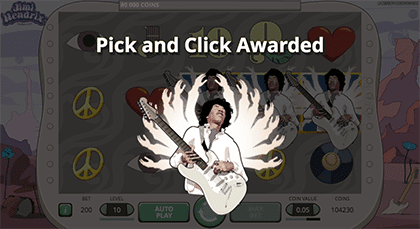 While the animations and graphics of this title aren’t as dynamic as some of Net Entertainment’s other real money slot game, the design certainly reminds us of some of the artwork of Jimi Hendrix’s classic album covers; in fact, the older style design lends itself perfectly to this game. The Jimi Hendrix songs and guitar riffs in the background provide great atmosphere, and the epic spread of bonus features is truly something to admire from Net Entertainment. The ability to bet anywhere between $0.20 to $200 per spin also makes this one of the most versatile online video slots around, suitable for casual punters and high stakes gamblers alike. We rate the game 4.5./5. 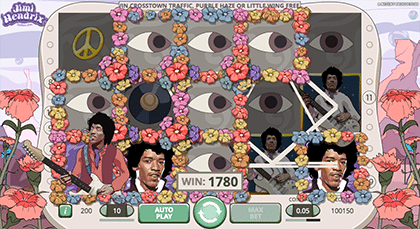 The Jimi Hendrix mobile slot game is just one of three high-voltage titles in the NetEnt Rocks collection. Click the links to check out our reviews of the Guns N Roses and Motorhead video slots.